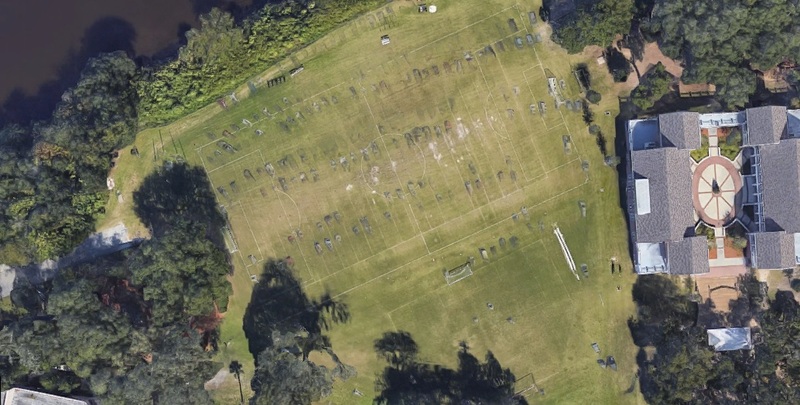 New Jax Witty: Soccar Field at The Episcopal School? Soccar Field at The Episcopal School? With an upcoming trip in the works to the Episcopal School of Jacksonville, I went onto Maps to check out my route. After being sure of how I'd get there, I decided to take a satellite tour of the campus. I was kind of looking for parking, since I think I've parked in the staff lot here in the past. As I navigated around the campus, however, I saw what almost looked like a parking lot on a soccer field (or soccar field as I renamed it). What is up with that, Google Maps? I assume that this field is sometimes used for parking. Maybe for big football games. Maybe even for the school day. I hope not, as it seems like it would be a great location along the river and kind of wasted as a parking lot. I'm just not sure why a temporary parking lot would show up with cars that are kind of half there and half erased. In 3D, no less. Almost like some kind of car cemetery. I had not remembered seeing this effect on other satellite imagery, so I checked again. Another local parking area. The vehicles look like they are all really there, and not half-ghosted. 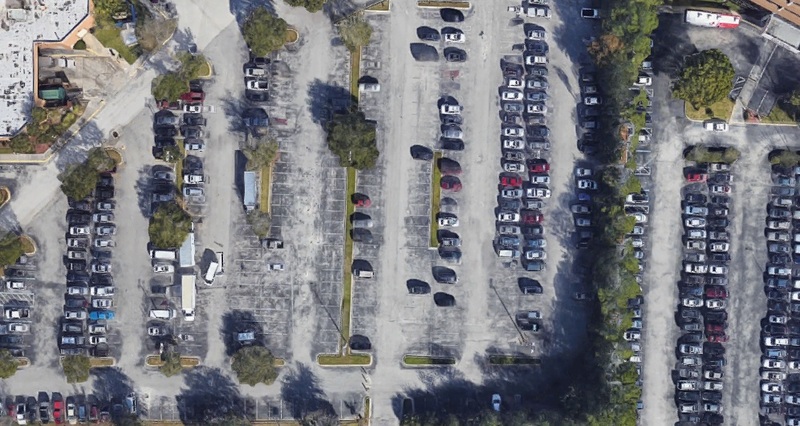 I started thinking the cars might get that effect because of people leaving while two or more satellite images were spliced together. I found a Walmart parking lot, and this theory seems to have some validity. I assume the way the 3D effect works is by using two or more images of the same location. 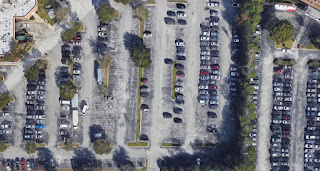 I am not sure of the difference in time, but the fact that most parking lots seem to have the same cars means that the timing is fairly close. Within an hour, probably, or else all that ghosting would always occur, I think. 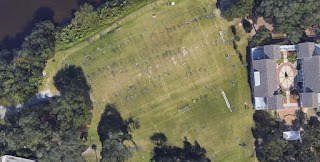 I guess my assumption is that the first image of the Episcopal soccer field was taken just before some event or school day ended, at which point all the cars left. Next, one or more images were taken of an open field. Then, the Google supercomputer tried to add three dimensions to cars that had left the area. It's similar to the effect seen with some cars in shopping center parking lots, but this one just seems more pronounced, and in a weird place. With limited parking, I assume the soccar field is sometimes used, though I have not seen it in that capacity. It's probably not as glamorous to donate money for a new parking structure on campus rather than a new field house or football stadium.